Can Apple Make Distance Learning "Magical"? Years ago, I remember coming across distance-learning courses in Second Life. 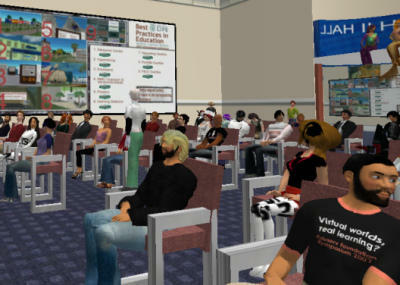 At the time, I thought it was extremely cool, as institutions like Harvard held classes inside the virtual world. The whole idea was to create a learning environment for people, no matter where they physically were, by giving students and teachers the opportunity to be present together via digital avatars. Innovative? Yes, I still think so. But the problem was the medium: Second Life. Though it had caché at one time, it never quite caught on with the masses. It was clunky and difficult to use, and there were so many distractions within that realm. Let’s face it, most users weren’t there to learn — they were there to shop, fly around, build stuff, get virtually married or see what life would be like if they were bunny rabbits or dragons. And so, education efforts inside those rendered environments wound up being relegated to little more than niche projects. Not quite the thing if the goal was to spread the learnin’ to more folks, eh? Fast forward, and we’re staring down the barrel at Apple’s education event today. Maybe it didn’t have the glitz and splashiness of the company’s hardware announcements, but I think some good things came out of the New York City press conference. Several things caught my eye — such as Cupertino’s savvy move to unveil high-usability authoring tools alongside its new applications — but what made me more excited was the potential for distance learning that these tools offer. In addition to the textbooks available through iBooks 2, the new iTunes U offers a feature for streaming lectures and videos. That’s interesting, especially given that iPads are fairly commonplace now (and are bound to be more so, if this strategy pays off), with a high usability factor that could appeal to rumpled educators unaccustomed to the high-tech lifestyle. And if the company can bring more universities and academic publishers into the fold, it may do for education what it did for music. (And movies. And mobile apps. And…) Imagine being able to attend classes from anywhere. Or auditing a very intriguing course from a school two states away. With the streaming and communications hub in the new iTunes U, not to mention easily downloadable textbooks via iBooks 2, that all might be possible and (the key word here) easy. Still, I like where this is going. And I plan to keep my eye on it, to see if Apple (or its competitors) can succeed in turning off-site learning into a magical experience for the mainstream. What do you think about Apple’s answer to modern education? 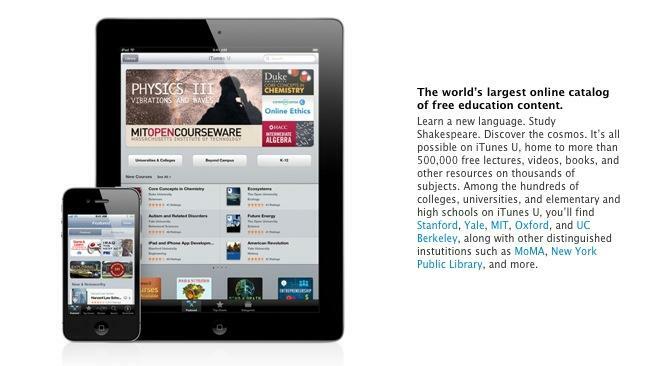 Would you be excited if more high schools, colleges, and universities started offering distance learning via iPad apps?